Fake News. We've heard that phrase a lot over the last year, but it’s not a new concept. In fact, the problem of fake news is something that we’ve been struggling with for decades, and misinformation and propaganda seem to have been a problem as long as human society has existed. In the more recent past, fake news was known as 'yellow journalism,' but with the ability to easily spread information across the world with the Internet, it seems to be a growing problem with no end in sight. So just who is this fake news affecting and why? Virtual Market Advantage will take a closer look at the issue and try to determine if it’s a problem that can be solved or one that can merely just be managed. Known in the past as Yellow Journalism, fake news was and still is a style of newspaper reporting that pushes sensationalism over the facts. An example of this is the tabloids sitting at the grocery store checkout stands. This sensational style of ‘news’ writing went so far as to start wars in the late 19th century. The Spanish-American War of 1898 is sometimes called “the Journal’s war,” since yellow journalism played a large part in how it began. Many historians consider this war to be the first one so heavily affected by the media. In modern times, fake news has the potential to sway how people think and vote. Over time, sensational writing has carried on, never disappearing completely. It was bad enough when it was published in competing circulations, but the rise of the Internet is making it easier to spread a huge amount of sensationalized content instantly anywhere in the world. As amazing as the Internet is, it has its share of problems, especially when it comes to false information. Anyone at any time can put any headline out there, and someone is bound to jump on board and believe it, no matter how outrageous the claims. A key example of how fake news can affect a large group of people or even businesses is the story of a headline and short story that Dow Jones Newswire published as a technology test. The article stated that Google planned to buy out Apple for $9 billion. That’s a crazy statement, since Apple is worth an estimated $800 billion. However, the short story went on to say that Google CEO Larry Page had secret talks with now-deceased Steve Jobs back in 2010 to settle the deal. Dow Jones quickly deleted the story after a few minutes, explaining it away as part of a technology test, but at Wall Street, the effect of the headline had already started. The stock traders barely had time to digest the crazy news before Apple stock prices jumped to $158 from $155. Who is Affected by Fake News? So who was really tricked here? The stock traders, the general readers, or Internet bots? A growing number of stock trades are controlled by computer algorithms (bots), which scan twitter feeds, news headlines, and other forms of social media to get a lead on information that can move the markets. With most stock trading being done by these bots, it’s clear that the jump in stock in this case was due to these bots scanning that headlines. On a smaller scale, fake news affects everyone who browses the Internet. I’m sure we can all can think of a time when we saw a sensational headline and thought, “Wow, that’s crazy!” before later realizing that the correct response was probably, “Is this true?” Most of the time, these stories aren’t particularly harmful, and just serve to provide entertainment. However, when they start to affect how people see the world around them based on incorrect assumptions, problems begin to form. With the times changing, whether stories are true or fake news, they are being released faster than they can be processed. So what can actually be done to combat the release of fake news? Can the Fake News Problem be Solved? 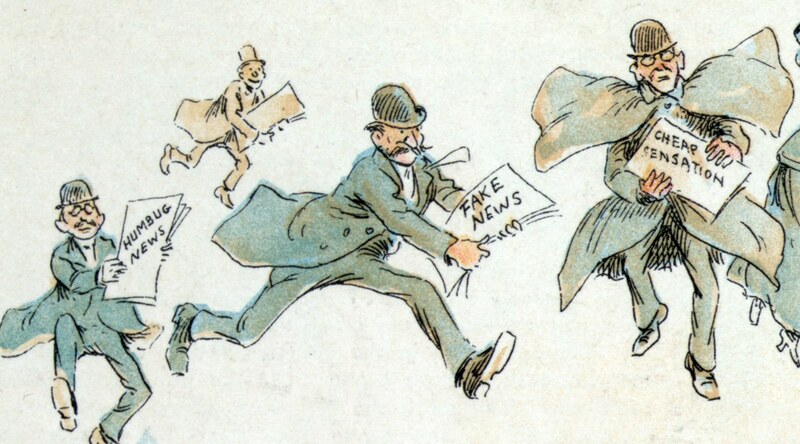 With the likes of Facebook and Google fighting to combat fake news with little success, it seems that the flow of fake news and false content is something that cannot be completely stopped. If these huge content pushers can’t get a handle on the problem, who can? A survey done by Pew of over 1,100 tech experts found that 51% of these experts believe that the fake new problem will only continue to get worse over the next 10 years. For the majority of experts, the situation does not look good. There’s a strong human desire to see pleasing or entertaining content, whether it’s true or not, and no tech company will ever be able to compete with that. This desire will just feed the fake news flow, and it’s likely that no technological advances will beat our human desire to control it. However, there is faith in our tech ability from the other 49% of experts who see fake news getting back under some sort of control. They think that with tech fixes and our ability to recognize a threat to truth, we can all collectively find a solution. For now though, the tech giants are still struggling to produce a system fix to slow the tide of fake news. Facebook is introducing possible fixes to its algorithms to supply fact checking in the background, and Google is trying to combat its fact checking problem with honest answers and articles. But until these systems are put into place, perfected, and begin to work, fake news headlines will still affect us daily. With the invention of the Internet, the initial idea was to have a library type of database so that everyone everywhere could have access to information. This also included misinformation. With no one there to fact check what was being put on the Internet, the onslaught of fake news instantly grew. The tech giants had no way of knowing just how bad it could get with the fake headlines or that other countries could possibly sway a large population of our own by posting all sorts of false facts. Now that they do know, they are scrambling to find a fix. So far, the new algorithms to fact check ads and news stories are not being built fast enough and are losing ground to the fake news headlines that pop up daily. Will these fact-checking tools be good enough to squash the fake news in the end? Only time will tell. Social media outlets like Facebook and Twitter were not invented to be journalism sites. They were made to connect people with others online from around the world. So it doesn't seem fair to make them the leading force to regulate fake news, when they were not designed to be a part of the journalism world. However, you are given the option on these sites to share news stories no matter where they come from, and it does fall on them to make sure what their users are sharing is accurate news. This is a vicious cycle that can seemingly not be stopped by any one company or person. It’s going to take the cooperation of individuals and companies around the world to slow down the tide that is fake news. If you want more information on Google algorithms, check out VMA’s blog that goes over some factors that don’t affect Google rankings.